FAMCO is currently overstocked in 6, 7, 8, and 14 inch Aluminum Wall Vents with Damper. We are currently offering special case pricing for models WVEBA and DWVA (in select sizes). We use high end, top quality .020 Aluminum to build our products, which will ensure a long hastle free life for your installation. Many people living in coastal or humid areas will specifically seak out Aluminum building materials for its ability to resist corrosion, and not errode away as some lesser quality materials have been known to do. Our model WVEBA is an exhaust vent that has a light feel spring to control damper flutter, a gasket for a quieter better performing seal, removeable bug/bird screen and is available in stock to ship today in sizes 6, 7, and 8 inch diameter. Our model DWVA is an exhaust vent that has a gravity damper and is available in stock to ship today in 14 inch diameter. 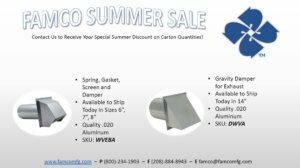 We have many other building options for vents and caps such as copper, stainless steel, galvanized steel, and pre-painted steel in a wide selection of sizes and styles, including plastic.